It's jobs day. The government said Friday that employers added 162,000 jobs in July, while the unemployment rate inched lower to 7.4%. Economists were expecting a gain of 180,000 jobs in July, according to a survey by CNNMoney. And the unemployment rate, which stood at 7.6% in June, fell more than expected. U.S. stock futures edged lower as investors digested the news, including revisions to data from prior months. The response in the bond market was more pronounced. The yield on the 10-year Treasury note sank from about 2.74% before the report to 2.61%. The Federal Reserve has said that improvement in the job market could be a trigger for the central bank to begin removing the liquidity it has been pumping into the market. But the latest job data may have caused investors to reconsider the assumption that the Fed will begin tapering its bond buying program as soon as September. The U.S. dollar was also under pressure following the jobs data. The greenback was down 0.7% versus the U.K. pound and 0.4% versus the euro. On the corporate front, Dell (DELL) shares rose following news reports saying the PC maker may be near a deal with founder Michael Dell and Silver Lake Management. On the earnings front, Toyota (TM) reported a 94% jump in quarterly profit, helped by a weaker yen. Viacom (VIA), a media company that owns brands like MTV and VH1, reported a jump in quarterly revenue and profit. Shares of Weight Watchers (WTW) plunged after the company reported weak earnings and announced that CEO David Kirchhoff will step down. U.S. stocks rallied Thursday, with the Dow Jones industrial average and S&P 500 closing at record highs. The S&P climbed 1.3% and closed above 1,700 for the first time ever, while the Dow advanced 0.8% to a record high. 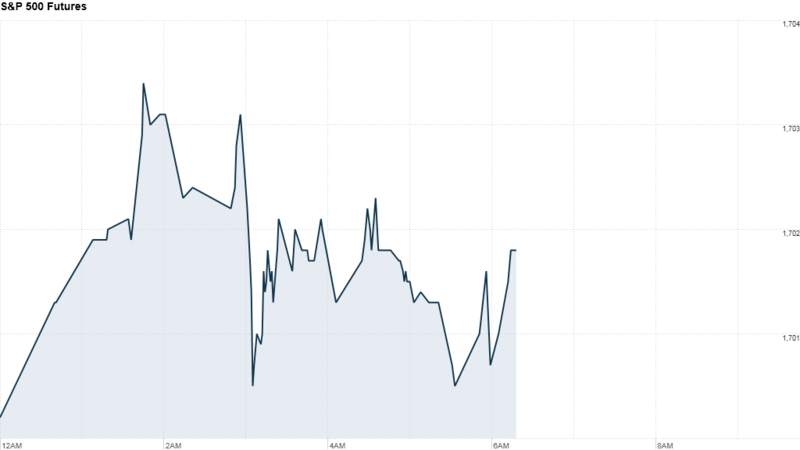 After the closing bell, LinkedIn (LNKD) reported better-than-expected results and boosted its full-year forecast. The stock surged in premarket trading. AIG (AIG) shares rallied in premarket trading after the insurer announced plans to reinstate a dividend and buy back shares. In Europe, most of the main market indexes edged up in morning trading, though the gains were very small.